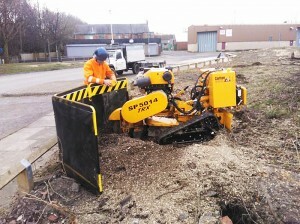 Tree stumps can be physically removed at any time. 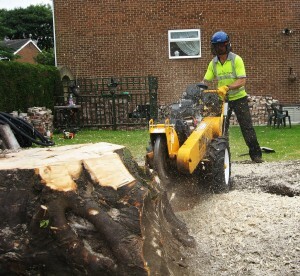 Paying tree surgeons to remove stumps when they are felling the tree is the most convenient way to remove stumps. 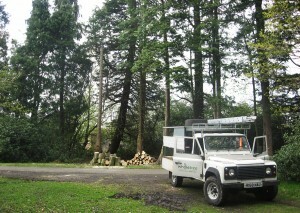 Chemical stump killers need to be applied to freshly cut wood, so are best applied immediately after felling. 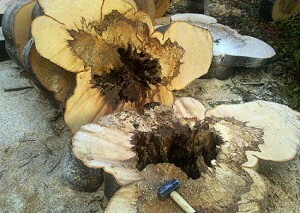 Otherwise, they will need to be re-cut before the product is applied. 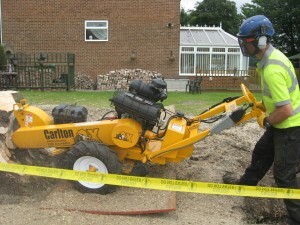 To facilitate quicker stump removal we can use a winch depending on the size of the stump, or we use stump grinders which mechanically grind down the main root leaving just sawdust. We have stump grinding machinery that will cater for any root size. We are able to grind tree stumps down to 18 inches below ground level, so whether you intend to lay turf (needing only a shallow grind), replant or plan to landscape/redevelop the area, you can be sure our stump grinding service will meet your requirements. 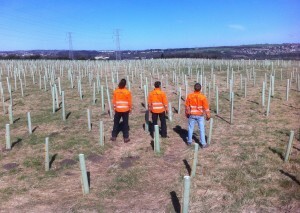 Using a remote controlled stump grinder on the site of a new supermarket in Gateshead.